(Boston, MA June, 2017) Disputes over fine art looted by the Nazis have received renewed attention the past twenty-five years. While some of those disputes have been resolved through negotiations, many others have ended up in court. 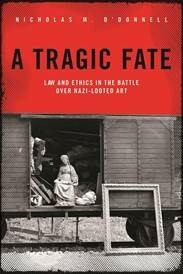 In a new book published by Ankerwycke Books, A Tragic Fate—Law and Ethics in the Battle Over Nazi-Looted Art, author Nicholas M. O’Donnell provides the first comprehensive study of the legal battles in the United States over art stolen in Europe before and during World War II. Author Nicholas M. O’Donnell, a veteran attorney and litigation partner at the international law firm of Sullivan & Worcester LLP and its Tel Aviv joint venture partner, Zysman, Aharoni & Gayer/Sullivan & Worcester LLP (ZAG/SW), has assembled the legal and historical background of looted art from the Third Reich to the modern era. A Tragic Fate puts in context the continuum from the Nazis’ first legislation against Jews to the legal principles that have determined the outcome of these ongoing court disputes. The Nazi looting of art and cultural property from Jews in Europe was unprecedented, ranging from a massive and organized plunder by the government for the benefit of German museums, to individual thefts by opportunists and Nazis. When the war ended, the Allies enacted a series of far-reaching laws and regulations to undo seizures of property from Jews. Yet, that effort did not extend to finding the individuals from whom the art had been taken, or their heirs. For decades, there was little attention and even less action around seeking to account for looted art. This changed in the 1990s as the Cold War drew to a close, when new scholarship and attention culminated in the international Washington Conference on Nazi-Era Assets in 1998 and the announcement of the Washington Conference Principles on Nazi-Confiscated Art. These principles, and the ethical guidelines from museum associations, changed the perspective of the conversation on the need to find “fair and just solutions” for the victims of Nazi looting and their heirs. Yet, inevitably claimants turned to the courts of the United States. A Tragic Fate explores what has happened once the parties turn to the legal system. Reviewing the American litigation comprehensively for the first, O’Donnell analyzes the strategic, tactical, and ethical choices that the claimants, collectors, museums, and foreign countries involved have made over the course of these debates. A Tragic Fate combines the human stories behind the court cases with legal analysis of the outcomes that will be a resource for readers ranging from seasoned practitioners in the field to historical scholars to the general public. A Tragic Fate is the first compilation of the whole story, in addition to providing a review of European efforts to create alternatives to litigation that have in many instances ironically driven the parties into litigation. O’Donnell is the leader of his firm’s Art and Museum Law practice representing collectors, dealers, auction houses and museums in a wide array of areas related to the art. He is the Vice Chair of the International Bar Association’s Art, Cultural Institutions and Heritage Committee, and a member of the Art Law Committee of the New York City Bar Association. He is the editor of the Art Law Report. Shortly after A Tragic Fate went to press, as counsel for claimants to the famed Guelph Treasure in Berlin, he secured the first ruling in history finding jurisdiction over Nazi-looted art claims against Germany in a U.S. court. A Tragic Fate can be ordered here for immediate delivery: https://shop.americanbar.org/eBus/Store/ProductDetails.aspx?productId=276889910&term=nicholas+o%27donnell. “Lawyer Nicholas O’Donnell delves deep into every case of Nazi-looted that has come before U.S. courtrooms, looking at the ethical and issues involved. He clearly explains the various strategies and tactics used by claimants, museums, and current owners in sometimes tense legal battles and analyzes their outcomes. Looking beyond the United States, he charts the responses to restitution questions in European countries, which vary from token to downright hostile. The book is recommended for anyone seeking an overview of this most tragic subject from the U.S. legal perspective and the efforts to return art to its rightful owners—which continue to this day.” —Georgina Adam, art market editor-at-large, The Art Newspaper; art market contributor, The Financial Times; author, Big Bucks: The Explosion of the Art Market in the 21st Century.